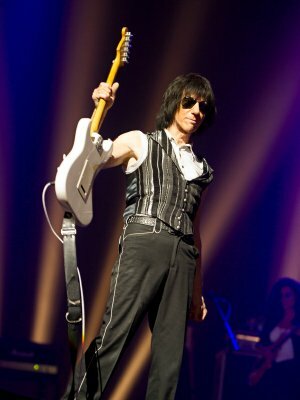 As Jeff Beck continues a busy year, bringing out a new album, Loud Hailer, touring with Rosie Bones and Carmen Vandenberg and bringing out his first book, BECK01, with Genesis Publications, he spoke to Uncut magazine about his latest projects. Throughout the interview, Beck spoke of his love of movies, hot rod cars, and the musicians who have inspired him. Uncut said of BECK01: "Alongside photos of hot rods he's built over the years are pictures from his five-decade music career: with The Yardbirds, David Bowie, Jimmy Page, Ronnie Wood (a former Jeff Beck Group bassist) and Buddy Guy - one of his guitar heroes - with whom he's touring America this summer." During the interview Beck opened BECK01 at a photo of the movie poster for A Girl Can't Help it, saying "If ever a movie was life-changing... I sat there in that beautiful old cinema and thought, 'That's what I'm gonna do.'" This book charts Beck's growing interest in rock n' roll as a child, watching movies in Wallington, to his career with The Yardbirds, Jeff Beck Group, solo work and more. To find out more about BECK01 visit www.jeffbeckbook.com.